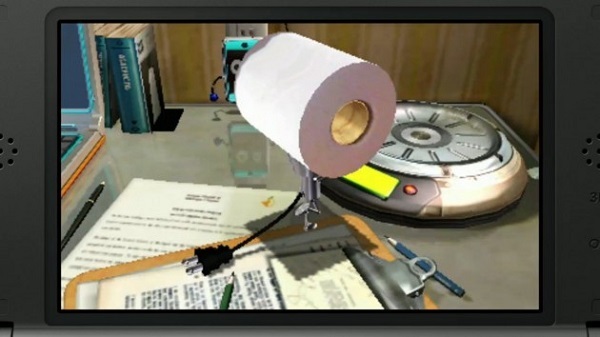 If you choose to play Chibi-Robo: Photo Finder, I suggest you beeline it to the end of the game. Buy a bunch of the cheapest film you can and take all the pictures you need to fill up the museum. Then, after watching the (decent but surprise and thrills-free) story, you have the freedom of infinite battery, all the jobs being open forever, and the ability to really delve into what the game has to offer. Unfortunately, the two things it really offers are mostly unoriginal minigames and a rather broken photo-taking mechanic. Even still, playing specifically to reach the end is way more fun than the experience that I had when playing as intended, in which I saved up my Happy Points to buy new film and continuously fill the museum with new NostalJunk. Because if you’re playing like I did, you find yourself wrestling with everything wrong with the game. You’re trying to take pictures of things, using the silhouette film the game has and the 3DS camera to find items that match the silhouettes and transform into the game. The items are all supposed to be things the developers had in mind, but it never says what it is until you take a successful photo. So a soda can may be super obvious, but what if you have a silhouette that’s just a square? A circle? A weird bulbous shape that I still don’t know what it was supposed to be? I spent some 30 minutes trying to line up a picture of a manila envelope only for it to turn out that it was supposed to be a tea bag. Another I took of a DVD box was supposed to be a book. Some items even start out as one shape, so you take a picture, and then it transforms into something else--a brick I snapped suddenly became a car--so it adds layers of misdirection on top of obfuscation. Since eventually the game starts asking for things you might not have laying around (e.g. an airplane, a vending machine, a WiiU GamePad), you find yourself either having to draw a picture or take a chance on Google Images. At first, it seemed like the game really delighted in the idea of turning everyday objects from your house into something in the game--it’s admittedly kind of neat to see my GameCube turned into a game item--but it starts to be weird when it’s something more obscure. What’s the game’s audience supposed to be, then? Does it want us to create our own illustrations? After all the idea that I have everything the game is asking me to take pictures of, and in the exact shape they’re asking for, is pretty unlikely. I don’t have tea bags in the shape they’re asking for. My gloves have thumbs further down than the ones shown in the silhouette. I just don’t drink soda. So I just wind up not knowing what they’re actually going for, especially since you have to earn the ability to take pictures that just cut out whatever’s on screen and make the item out of it. Example: if you get 100% accuracy on the rolling pin, you can then cut out, say, a picture of your dog and your dog will get wrapped around it and it’ll be a hilarious dog rolling pin. If you’re supposed to make pictures of your own things, then why isn’t that an option from the beginning? Or have optional, more expensive film that you can do that with for things you really can’t find a good object for? And on top of that, you’ll spend a lot of time wresting with the 3DS camera, probably one of the worst cameras I’ve ever used. It has terrible low-light vision (bad news for my apartment, and bad news for anyone who wants to play at night) and has a hard time distinguishing objects from the background, adding an extra level of difficulty when it comes to positioning yourself and the object to take a picture. If you take a picture that matches anything less than 100% though, you’ll risk a piece turning into a NostalDud, which just floats away. It’s a terrible mechanic that feels like the game is punishing you- you can never turn a NostalDud back into the piece it had been, so all of that time just got wasted. If you collect 9 of these, you CAN turn them into a new film, but that means that the game has to have chosen your object as a failure 9 times just for the privilege of getting 1 new item in return. Your currency, Happy Points, are earned by either cleaning or doing jobs. Jobs are basic minigames- shooting galleries, following a character as he hides behind objects, finding food that chefs ask you to get them- and there isn’t much to them, or a reason to replay them aside from getting more points or trophies. I get that this game is probably meant for younger kids, but that’s no excuse for not coming up with something more interesting, especially since some of them ask for a lot from you. What kid is going to know the ingredients for Margherita pizza, or what a nightshade vegetable is? Are kids going to really have the patience to do a game where you have to measure stuff? Or another game where you have to randomly guess which random box has a bomb in it? It’s a bummer on top of that that most of the characters are pretty interesting and could offer different types of games anyways. Series stalwart Drake Redcrest does a good job of giving you some shooting games, but newcomer Joshy Bear, the rapping, break-dancing, bear-shaped sponge, just has you clean a room, which you already do outside of his task. Miss Clayra is an alien who runs a daycare. Moshi is a flying bear thing with two brothers, all of who love racing cars. Squid Vicious is a squid who works at a sushi store. But these aspects are touched on in only the most basic way, so while their dialogue and characters are neat, the gameplay just falls flat right there, not taking advantage enough of who they are to present you with something fun. Since Happy Points are earned best through jobs, the way they work really slows the game down- you get a large amount after filling up an exhibition room, but then when you finish them, only one or two will pop up, and then it’s never a guarantee. When the film becomes more expensive, you really feel this, since completing all the tasks might give you only 2 new films, and now you have to just clean to slowly get 20 or so in a go and slowly work your way to a new film. Or, you know, buy a bunch of cheap ones, fill the museum, and THEN go back through it all at your heart’s content. So this winds up making the game just feel like it doesn’t have anyone to appeal to since it can't achieve its goals well enough. The photos are a pain to take, the jobs are basic and don’t pop up enough to give you the points you need, the characters are neat but underutilized. If it’s a game for kids, it’s shallow in a way that is somewhat insulting, frustrating in parts and requires too much knowledge and access to things a kid might not be able to do. While the idea of turning real world items into in-game ones is pretty neat, the game throws in everything it can to make the experience as uninteresting as it possibly can. Tangram Style is a fine game using an age-old concept, and making it a touch-oriented game makes manipulation of the shapes much simpler than if you just had a controller. It’s a shame some of the weird recognition stuff gets in the way, but if you just want to solve some puzzles, it’s more than adequate, and if you can solve them fast enough, even the time trial modes are easily overcome. The price may be a little steep for what you’re actually getting, but at a little over one cent per puzzle, you’re certainly getting a good bit of puzzle mileage. The difficulty of having Tower Defense and RTS games where you have a central avatar seems obvious: you need to be omnipotent on the battlefield, but these games limit you too much to really be enjoyable. Instead of zooming over, you must saunter. Giving orders can only be done to specific units who are close enough to you. And if you spend time splitting between two severely different genres, it’s unlikely those two are ever going to come together in the way you want. It’s a lesson Dillon’s Rolling Western: The Last Crusade could have used: it’s not always good to be genre-straddling, especially when you do it in a way that leaves both your genres hamstrung and uninteresting. This all makes The Starship Damrey the kind of game that just seems a little too old fashioned. Game storytelling, even in adventure games, has come a long way, but this is too straight forward, not focusing on immersion as much as it seems to think it does. While I did like the act of slowly going from each area and unlocking the ship, the story payoff isn’t good enough to justify it. They can put in as many twists as they want, but withholding this information felt more like cheating than actually surprising me, making the multiple epilogues feel unearned. I certainly appreciate the game existing on the eShop, but unfortunately, The Starship Damrey needed to have better storytelling and a better payoff to make the download worth it.